So what is it? the Roast Beef Ring (RBR) is simply a tribute to the work of Chris Onstad, the author of the webcomic Achewood. 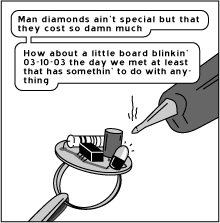 Back in 2007, Onstad published a little comic where a main character - "Roast Beef" - wants to propose to his girlfriend. But finding himself strapped for cash, decides to build his own ring. 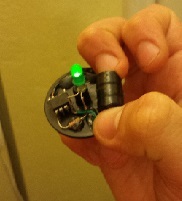 I set out to try and replicate the ring using an ATTiny85 and a couple of parts I happened to have on hand. After I got the ring done, I put together a little video describing it for some fans of the webcomic. The response was a little overwhelming. 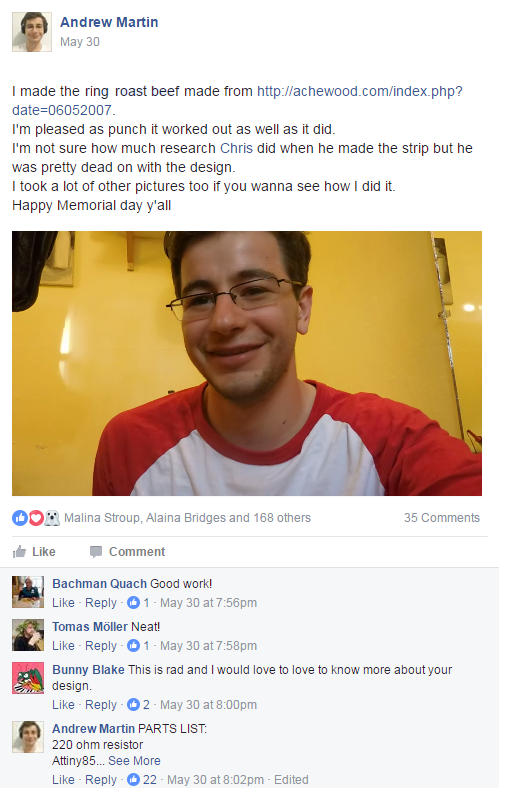 I ended up getting an incredible response, including a shout-out from the creator of the webcomic (Chris Onstad) and a request to do an interview for an article. After speaking with a few fans about the design, a bunch wanted a ring for themselves. Feeling a bit overwhelmed, I stepped back for a while and dropped the project. I finally made contact several months later with Janet Jay, and followed up on her request to do an article. The rest, I suppose is history. My work with the ring is done (for now), and unless I put together a PCB I don't see much more work being done with it in the future. I want to thank Janet, Shyam, Chris, and all the members of the Chochaco group who supported me throughout the whole process.